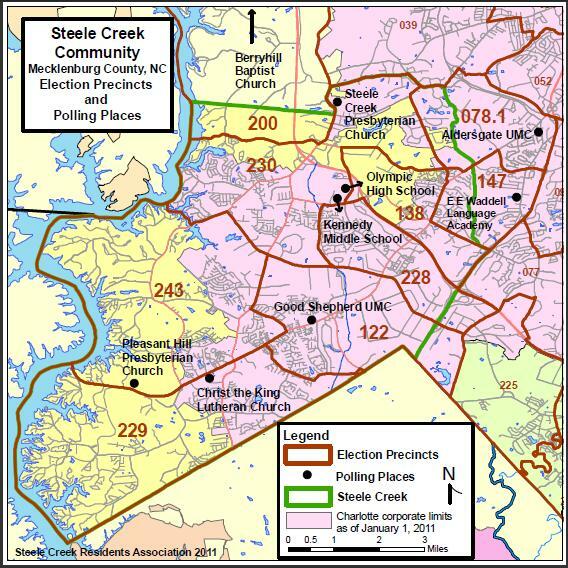 (October 19, 2015) One stop early voting for the 2015 General Election begins at the Steele Creek Library (13620 Steele Creek Road) on Saturday, October 24 and continues through Saturday, October 31. Hours are 10:00 AM to 7:00 PM on Monday through Friday, 10:00 AM to 1:00 PM on Saturdays, and 1:00 PM to 4:00 PM on Sunday. Click HERE or on the image below to view a list and map of the other sixteen early voting locations in Mecklenburg County along with the election schedule. Voters will not be required to show identification until the 2016 elections. Eligible individuals may register to vote during the early voting period. Although the North Carolina General Assembly eliminated same day registrations during early voting, this and other provisions of 2013 legislation that tend to limit voting opportunities are subject to ongoing litigation in federal court. Charlotte voters may vote in the elections for Charlotte mayor and for at-large and district city council seats. All Mecklenburg County voters may vote in the election for Charlotte-Mecklenburg School Board at-large seats. Voters who do not participate in early voting can vote at their precincts on Election Day, Tuesday, November 3. 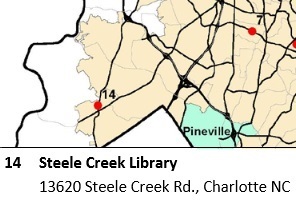 All of the parts of Steele Creek that are within the Charlotte city limits are within Charlotte City Council District 3. For information on candidates in other districts, see Mecklenburg County Board of Elections. School Board district and at-large representatives are elected every two years on a rotating schedule. All members serve four-year terms. The six District representatives were chosen in the November 2013 election. The three at-large representatives are up for election in 2015. School Board elections are non-partisan. from two-year terms of office to four-year terms of office? To verify your registration status, view sample ballots, and for more information about the 2015 elections in Mecklenburg County, see Mecklenburg County Board of Elections.